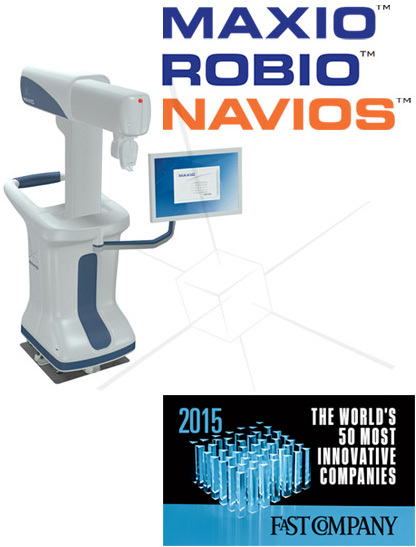 Perfint is a medical device company that develops robotic positioning systems for interventional oncology procedures. Perfint is based in India and had been selling its robotic positioning system (PIGA) throughout Asia for several years. It was planning to launch its next product — tentatively called “Pyrobot,” — in the United States. The new product would provide interventional oncologists with the ability to visually plan, execute, and validate ablation procedures on a single system, and all in 3D. Perfint understood that marketing to a sophisticated U.S. audience in the interventional oncology (IO) space would require a different approach than what had worked for them previously. 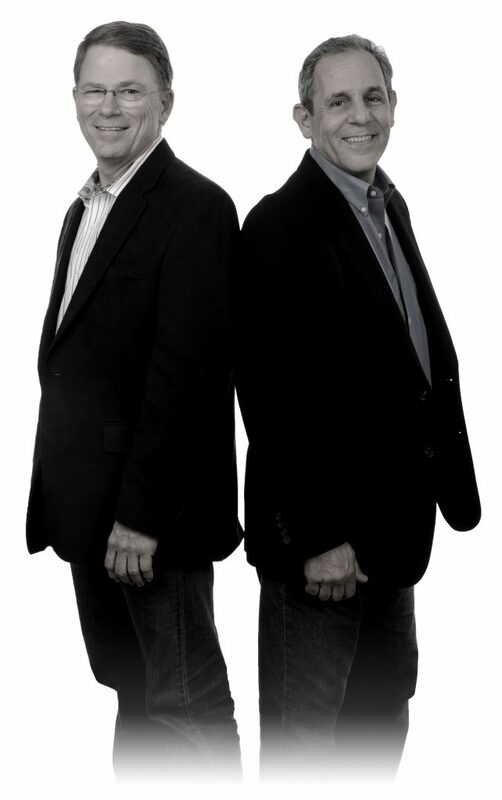 They turned to TR Design to develop the brand strategy, messaging and design for the launch of its new product. In the course of the discovery process, it was determined that the corporate brand and product architecture also needed to be addressed. Though we were initially engaged to develop the brand for a new robotic positioning system that Perfint was developing for the U.S. market, it soon became apparent through our discovery process that there were a number of related issues that needed to be addressed. The corporate tagline (Intelligent. Connected. Reliable) and logo (inspired by a firing neuron) were vague. Neither helped to position the company in the IO space, or to communicate their expertise (interventional positioning and guidance). The name of its existing product, PIGA, created unfortunate associations that we couldn’t overlook and its logo was inappropriate and inconsistent with the Perfint logo. The proposed name of their new product, Pyrobot, evoked images of fire breathing robots. In addition, the company had made a practice of treating each clinical application of the product as an entirely new product, which led to a product roadmap that anticipated many more product names to follow. Through our conversations with doctors who had tested the new product, it became clear that they saw great value in the imaging software which would allow them to plan their procedures in 3D. We recommended that the software be branded independent of the integrated system so that it could be sold separately as a training and planning tool, in addition to its inclusion in the fully integrated system. The Perfint assignment was as rewarding as it was challenging—requiring many of the skills that we think make us unique; the ability to work with client contacts from many different countries and many different cultures; the ability to understand the technical and the clinical, and craft brand messages and designs that appeal to a sophisticated and skeptical American audience; the ability to call upon our network of partners when necessary; and the ability to work around the clock, and around the globe to ensure a successful product launch. 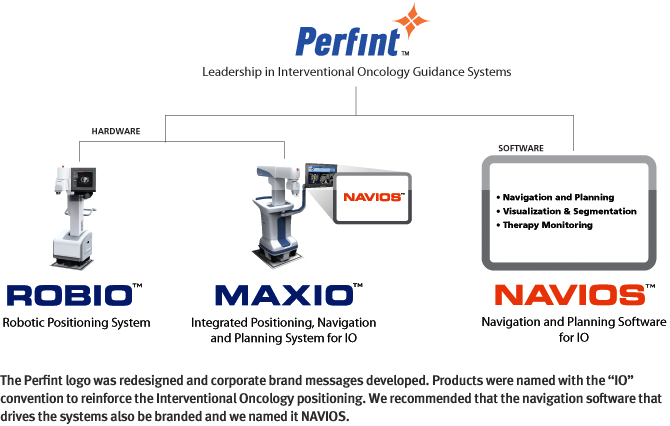 Perfint was new to the U.S. market with little or no name recognition, and delivering a new approach to the relatively new field of interventional oncology. We worked closely with the industrial design firm during the product design of MAXIO and encouraged the development of a look that would be state-of-the-art, but familiar, as if it had always existed in the CT suite.